AMTECH Tee/ "T" strainers designed to remove foreign particles from pipeline in process industry. Tee Type Strainers had a economy compare to basket / pot/bucket strainer to large nominal bore diameter has straining area . 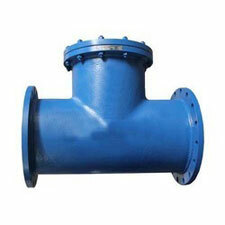 This strainer can be mounted into vertical or horizontal piping and can be configured for right-angled applications. Tee strainers are supplied with fine to coarse or vice-versa filtrations to ensure that the system is running at the required cleanliness level in full load operation. Tee strainers are features either bolted cover or quick opening covers for application suitability. Tee strainers are used where a compact accessible strainers is needed for protection of pumps, valves and similar equipment. SCREEN : SS 304/SS 316 as per the customized.